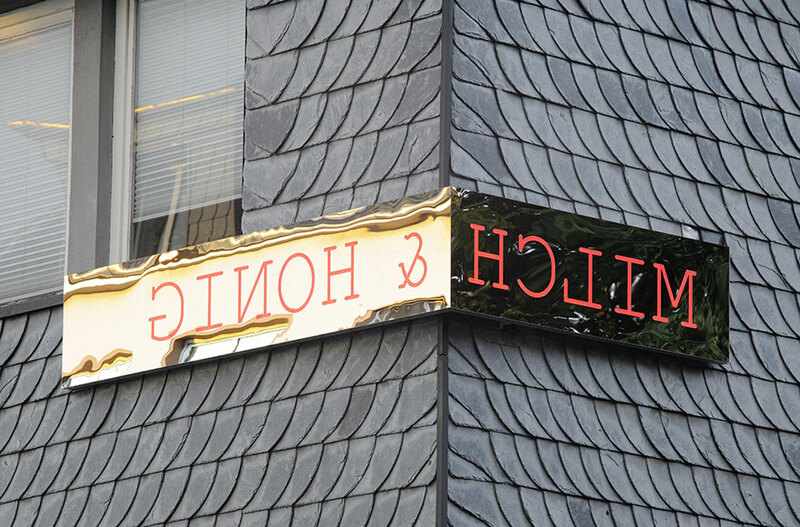 Back-to-front red LED text on two mirrors installed hori­zon­tally on the slate-clad exte­rior wall of the Museum der Stadt Ratingen. Two flat panels, 200 x 50 cm and 180 x 50 cm, mounted diag­o­nally oppo­site each other. At the vertex of Graben­straße and Peter­Brüning-Platz (a street and a square in Ratingen), located straight in front of the former Lintorfer Gate, the long-gone massive forti­fi­ca­tion system in the old city wall, is the admin­is­tra­tion building of the munic­ipal museum. It is a bare, three-storey struc­ture with a slate roof. The entrance area is situ­ated on the narrow side of the rectan­gular building and is adja­cent to Peter-Brüning-Platz and the Ehren­friedhof ceme­tery. The long side of the building, stretches, sloping slightly, into Graben­straße. 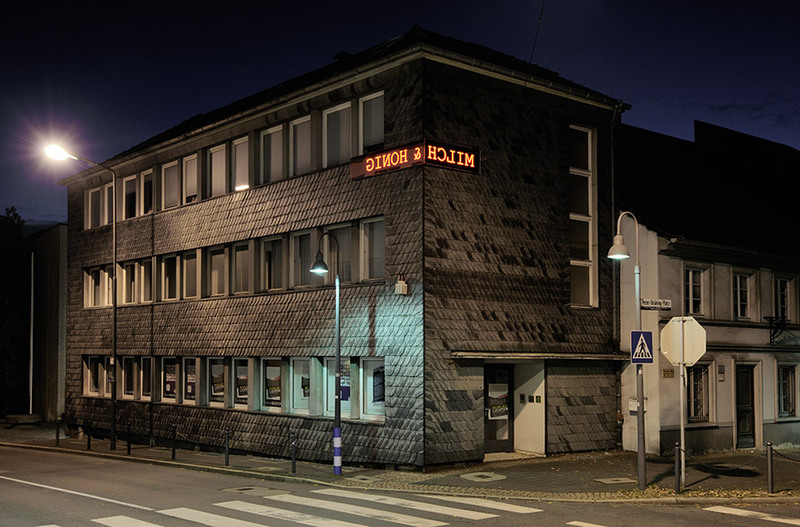 It is at the height of the second floor under­neath a window sill of this building that Thorsten Gold­berg has mounted the lumi­nous red back-to-front LED text “Milch & Honig” on two diag­o­nally oppo­site panels. From this posi­tion it glows and shows—glance fleeting glance almost symbolically—the spec­tator “the way to the promised land”, to happi­ness, freedom and paradise. At second glance however, it becomes apparent that this is an illu­sion and the ironic slant reveals itself: by just putting the letters back to front the legi­bility of the message is tampered with and thus the hopeful promise of a dream land is ques­tioned. * “Milk & Honey” refers to a passage in the Old Testa­ment in which God promises the Israelites “to bring them out of that land into a good and spacious land, a land flowing with milk and honey.”** This promised land is also used as a synonym for describing the Land of Milk and Honey. Similar to the idea of Arcadia or of paradise, it is used to express the desire for a better, easier, happier and more fulfilled life. * Klaus Thelen: Milch & Honig in Ratingen, in cata­logue: Blick­wechsel, Güter­sloh 2010.